As serious whitetail hunters, “It’s all about the details” is a phrase we’ve heard, thought and probably even said at one point or another. No question, details are certainly a major factor in being successful in the deer woods. In fact, I would go so far as to say that it often comes down to a few details that make the difference between a filled or unfilled freezer. When it comes to getting it done on public land though, concentrating on year-after-year consistencies can make a huge difference in regularly connecting on a big buck and periodic success. If cattle have been moved off a property and fresh deer sign is found, it’s likely you’ve discovered a hotspot where you need to spend some time, especially if fresh rubs (above) and scrapes (below) are present. This realization of looking at patterns over the span of multiple seasons came about from years and years of trial and error. Originally, being from Michigan, I dreamed, like many other hunters, about bowhunting the classic big-buck states. Yep, Iowa, Illinois, Ohio and Kansas to name a few, were on my hit list. Eventually, that dream was realized when I made my first trip to the Land of Oz. Kansas is a state with abundant public tracts and walk-in hunting opportunities, and this small-town Michigan boy’s head was spinning. I couldn’t get their fast enough. Fast-forward a few years and add a mix of blown opportunities sprinkled with some success, and a few consistencies really started to become apparent. On these out-of-state adventures, early on, I would spend a little over a week each season bowhunting these unfamiliar properties using standard approaches for trying to figure them out. You know them. I would find the buck sign, look for key funnels from terrain features and cover, identify bedding, food and the list goes on. Whether I was experiencing success or royally messing up, I was sure to note why, how and when deer were most active on a given property. During the first couple seasons, I experienced extreme frustration. It was rare to experience the same deer activity I had noted the previous year on any given property. Likewise, there were some pleasant surprises, like when I would find increased activity and sign on a couple properties that seemed to offer little the year before. I did my homework, stayed true to my notes and started to look more at the bigger picture. This is when things started to really come together. It became clear that even though it was ground open to the public, it was possible to find consistent patterns and trends for how deer use a specific property from one year to the next. Regardless of where the property sits geographically, I firmly believe every bowhunter needs to try and understand the role food sources play on the land. Understanding general planting patterns and where deer are primarily feeding is very important. Equally as important is how the deer in the area use those areas as the crops change from year to year. A common crop rotation in the Midwest is soybeans and corn. A great example of capitalizing on historic data regarding crop rotation was a hunt I had in Kansas in 2015. I hunted a piece of walk-in property open to the public in November 2014, with very little success. There was a good mix of brushy timber and CRP for cover, including decent mature buck sign from previous years. However, the closest food source was a cut soybean field a quarter-mile away. The few times I hunted the area, I saw only a handful of does and some young bucks. That was it. I knew the property had more to offer than what I experienced, so I put it on my scout list for my November 2015 return. The food source that was a cut bean field the year before was now a freshly picked cornfield. The property was torn-up with fresh buck sign. I picked a tree on the edge of the cover and CRP, then planned my access route for the next morning. At first light, a big 5x5 with stickers all over his bases worked his way up the edge of the CRP. If it wouldn’t have been for a poorly executed shot, I would have had my biggest buck to date on the ground. Although I wasn’t successful on the property that year, I was confident that the change to a more attractive food source was why I was seeing such an increase in deer activity. Logging that information for future use is huge from a time-management standpoint. Now I know on years when the food source is corn, it’s a great place to focus my limited time for this particular out-of-state trip. When it’s beans, I can focus my time on other tracts. Crop rotation can play a big role in public-land success from one year to the next. This cut cornfield and its few standing rows offers plenty of carbohydrate-rich groceries for the deer in the area. Many of the walk-in hunting areas in Kansas are owned by cattle ranchers who rotate their herds from pasture to pasture. Typically, this rotation is from spring and summer grazing locales to those more suited for fall and winter. It’s common for these tracts to have small draws and creek bottoms, or even moderate to large blocks of timber. These areas can be money for finding a big buck, but you must pay attention to the cattle rotation. There is a particular tract in Kansas that can either be red-hot for big deer or completely void of sign depending on whether the cattle have been moved off the property. The first year I hunted the property was a very dry summer, so the rancher moved his cattle off the property just before archery season. The dry conditions limited grass growth, and the herd had to be evacuated faster than normal. This allowed the deer to move in earlier and establish some patterns leading into the rut. After honing-in on a few key areas and reading sign, I was able to set up and kill a solid 4x4 by overlooking a primary community scrape area that was being used by a pile of different bucks. At the time, I thought I had struck gold. I assumed this would be a consistent year-after-year cattle pattern, and this would quickly become one of my go-to spots. Fast-forward to the following fall. Upon visiting my hone-hole, I was disappointed to discover there was hardly any buck sign and the cattle were still roaming the property. I chalked the poor sign on the property up as a fluke. The next year, the story was the same: lots of cattle and very few deer. This prompted me to start digging in a little deeper, trying to understand why it was so good one year and unproductive the following two. Once I started thinking about the cattle, the pieces of the puzzle fell into place. The historical pattern I’ve since uncovered is on dry summers the rancher would move his cattle early enough in the fall where the deer would move in and greatly utilize the property. On years with substantial rains that provided good long-term grazing for the cattle, the rancher would leave the livestock on the property longer, significantly affecting the way the deer used the land. Sure, deer will co-exist with cattle and this particular trend isn’t a steadfast rule across the board, but it certainly proved consistent for this particular area. It’s something to pay attention to if cattle roam the woods in areas you hunt. 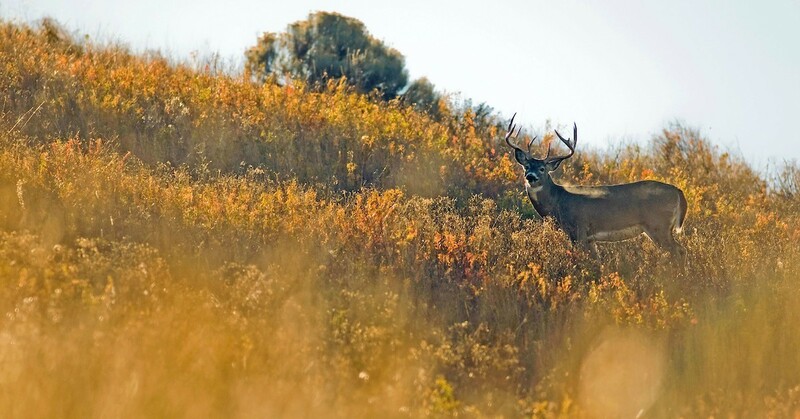 Changing and growing habitat in a particular area or property can be one of the most forgotten aspects to how once undesirable properties become incredible big-buck haunts. These aspects that change or improve are most commonly related to cover, typically either after a timber cut or when pasture is left unattended. When this occurs on property open to the public, we tend to write that location off and move on to better looking habitat. However, doing so and not keeping these areas on your scouting checklist can result in missed opportunities. The cool thing is positive habitat change doesn’t have to take years. In some states, it can happen quickly. Sometimes the state will come in and conduct a burn on native grasses or hinge-cut some timber to create thicker security cover for wildlife. In just one year these areas can change dramatically from what they once were. This is exactly why I create a scouting checklist of public properties that notes the current state of the habitat for each piece of public land I hunt, and I make sure to update it each year. A great example of evolving habitat is, again, a piece of walk-in ground I regularly bowhunt in Kansas. It is a fairly small, often grazed tract that sports a couple brushy draws in the middle of it. I hunted it a few times over the course of a couple seasons noting very little deer activity and buck sign. A few years back the rancher decided to stop utilizing the pasture for his cattle. In just a few years the once relatively short grasses and cedar shrubs grew and multiplied into solid habitat that offered good security cover. After just 1 year of not having cattle on the property, the buck sign increased significantly as the habitat continued to develop. If I simply had written this property off as just a cattle pasture and never checked it again, I wouldn’t have one of my most productive public hunting spots in my arsenal today. Noting year-after-year trends like crop and cattle rotation, along with positive habitat developments, paid big dividends for the author. As passionate bowhunter’s time in the field is precious, and it’s easy for us to get wrapped up in the details. I’m as guilty as anyone, and honestly, if it weren’t for paying attention to all the little things, it would be hard to kill a mature buck with a bow at all. Please, definitely continue to be detail oriented. Sometimes, however, we spend too much of our time looking through a microscope in terms of our strategies and approaches that we miss big, key factors that are right under our noses. It can make all the difference in the world to keep track and stay observant of changes on the public land you hunt. Take the advice mentioned in this article and apply it to your public land archery hunts, identify when the conditions are in your favor, and who knows, you just might find yourself earning consistent opportunities at mature bucks on common ground.